eleven months ago, i posted a tutorial here that utterly changed my blogging life. thanks to this scarf capturing the uber-chic style of the inspiration piece, that post caught fire (like a mockingjay, mo-mo fo-fos!) on pinterest and brought lots of DIY'ers here. i am so thankful because many of those pinny visitors have stuck around and really fanned the flames of my blogging passion with their encouragement and presence. back at the end of that tutorial, i begged anyone who tried the project to please email me a picture of their finished product. i filed the first few of these away and forgot that i had intended to publish them all at one time. well i guess i went on an ADD bender and completely forgot (though they kept coming in) for almost a year. today i rectify that by giddily showing off the work of some amazing sewists, crafters, pinners and DIY'ers. 2. there are some PRETTY ladies who tried this tutorial. seeing this makes my heart buzz. if i ever spot one of these scarves on a passerby in the street, i may attack with love and snuggles because that would be simply otherworldly. (who's got my bail money for the day that that happens and i get thrown in the pokey for flagrant groping?). it's beyond belief that i even get to see these on the internet and to know that the ones i make in my etsy shop (127 so far, i think!) are out there too, being worn by beautiful people all over the country and the world. the internet can be a discouraging place (my first ever hate-comment was actually last week, on this tutorial), but my experience has been overwhelmingly wonderful and affirming. seeing all of these scarves all together made by so many far-flung hands is one of the coolest bloggy moments i have ever had. thanks to everyone who has ever tried, looked at, pinned, read, or even just rolled their eyes toward my scarf tutorial post! and thanks for letting me be sentimental and pollyanna sweet for a moment here...over a scarf. did any of yall end up here through some internet rabbitty hole with this scarf at the beginning? *if i somehow left out your picture, send it to me again. and if you never sent one in at first, go ahead and keep them coming! i save ALL of these in a special folder in my email (putapuredukes (at) gmail (dot) com) and will publish every single one that comes in! That is exactly how I found you! Through your tutorial from pintrest...and I made the scarf and gave it to a friend for Christmas, unfortunately without taking a picture first :( but it was beautiful, gray and teal, and she loved it :) And now I am such a fan of your blog and tell everyone about it. I love your heart and honesty, keep blogging! ohhhh, gray and teal, i LOVe the sound of that. I came to you last November through a Pin of your killer-awesome scarf, and I check back daily to see what's going on with you and your beautiful family. <-- If that isn't creeping you out, probably we can be friends now. The only time I get mad at you is on days you don't post. I meditate on the fact that your soul purpose in life is not to blog witty life-updates for me; this is harder to believe than you'd think! Keep them coming, Keight. You're inspiring and hilarious. no creeps. we are totally friends now. even if you are sometimes mad at me. i figure that just strengthens the bond. Since you said we could be friends, you get a "get out of mad free" pass. This entitles you to one skipped day of blogging without me rolling my eyes and sighing loudly to my work computer. I found you through this post! Now I love your blog; it makes my day when there is a new post from you! and you, in return, have just made my day! Booyah, I'm famous. 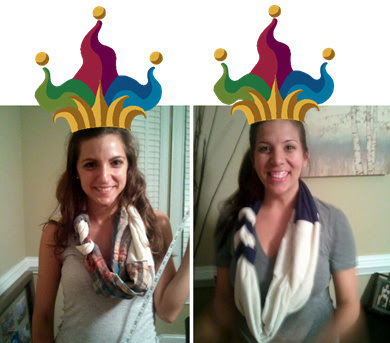 Well, my awesome scarf has made its internet debut and through some transitive property, it makes me famous. I've stuck around since that awesome tutorial and your honesty, humor, attitude, super cute kids, love for Jesus, and my boredom at work keeps me coming back. It wasn't the scarf; I've been around longer than that. (Though, it is a fabulous scarf.) No no, it was the marriage posts, the ones involving snot and pride and reconciliation and Jesus. And the fact that you might be someone Debra Joy would know and hopefully friend in the far-off future, blog-stalking seemed necessary. And really, aren't we all a bit creepy when it comes to our BFFs? Yes. Yes we are. Keight!!! That is SO my fabulous navy & lime scarf hanging on the back of the bathroom door in that picture up there!!!!! I found you through this tutorial & have been creeping here ever since! I love checking in here & seeing what you & your family are up to! Your warmth & wit make me smile and I am so glad that I found your blog! I must say I did not make this scarf, but I clicked on the tutorial plenty of times. Then I was doing some other trolling for a job and somehow stumbled upon your blog. I realized that you were the genius who pinned this scarf. But, your blog has given me more of a tutorial for a cute scarf... Thank you for your transparency and honesty through this blog. Looking into the the imperfections and wonderful things about your family gives me encouragement for my future. Thank you for your obvious love for Jesus, cussing, and DIY genius-ness. I too love getting the magic e-mail with more of your amusing tales. It always cheers me up without fail! Also I hope you told the hater to eff right off!! Then deleted them. I found your blog through the scarf tutorial just like so many others. I actually made a bunch of them and sent them to family as super late Christmas gifts! I've been keeping up with your blog since then. You are hilarious and so adventurous as you and your beautiful family go through everyday life. Your Stitch Fix experience has been one of my favorite things of late. I just ordered my first fix a few days ago and I can't wait for it to arrive! Thanks for sharing your life with us all! So I found you and your blog through Tara Livesay's blog and facebook. I love reading your writing (even though as a teacher your lack of capitals is a minor challenge!). I missed your original scarf post but found it while sitting in the Port au Prince airport after Tara commented on your facebook post about the negative nelly. The very next day while at my grandmother's house I was reading the All You magazine (May 2012 issue) (Yes, I know it was old) I saw your scarf and a link to your blog! I thought it was so amazing! I don't think my picture is there but I definitely did make one... now to unearth the pic, hmmmm.